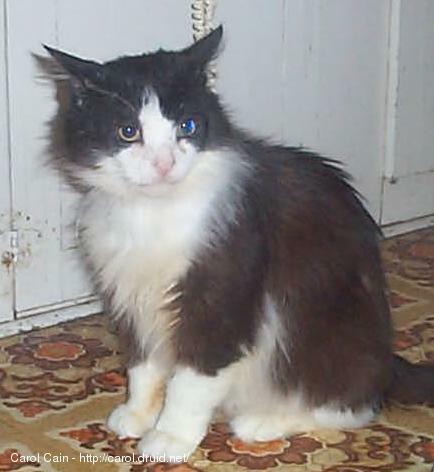 This page contains a little bit of information and suggestions based on my personal experience with domestic and stray cats. Please note that I am not a veterinarian or a licensed professional of any sort. Before you try anything here you should consult with your own veterinarian. If you are thinking about adopting a cat Here are some things that you should be thinking about. What breed should I get? Should I pick up a free cat from someone? Should I get my cat from a pet store or an animal shelter? How should I prepare my home or apartment for the coming of this new cat? How will my children get along with the cat? It is usually a bad idea to get a cat as a gift for someone. You should know what questions to ask when you first go to pick any animal from a shelter or pet store. It is a good idea to first seek out a good veterinarian. Please make sure that the animal is vaccinated against all these cat diseases and microchipped. When you get the cat home you may have to be patient and work with them. The cat might be shy or abused. It all depends on where the cats came from or how they were treated. I hope you don't dismiss cats with missing limbs or blind cats as they can also make good companions. After you have read this I hope that you will give a stray, abused or abandoned cat a chance to be your friend by sharing your home. Please remember Toronto Cat Rescue. Currently I take care of cats suffering from FIP and FIV for Toronto Cat Rescue. These are some of the stories on how we got these cats. I had the opportunity to take care of a diabetic cat and learned a lot about feline diabetes. If you want to try to protect your cat from most feline diseases keep them inside. 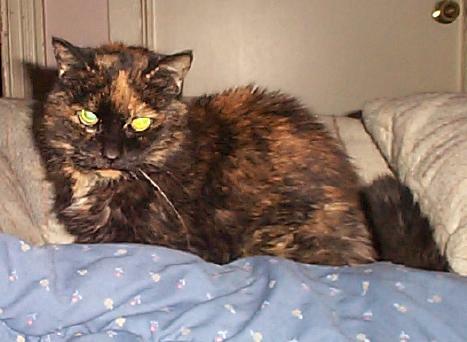 It all started in 1995 after our cat Tanya died my Husband and I started volunteering for Toronto Cat Rescue. 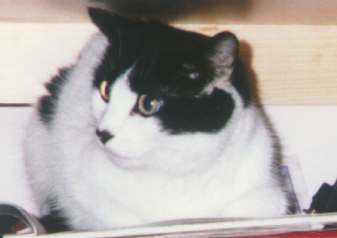 I remember fostering our first cat on March 4, 1995 his name was Albert and there was no turning back since. These healthy cats would stay in our comfortable home with us until someone would phone to adopt them. Than a cat came in on May 20, 1977. Her name was Dominique. The was diagnosed with Corona Virus and we lost her on July 28, 1998. Then we took in a tortoise shell cat. Her name was Cricket. She came in on May 7, 1998 and we lost her on May 26, 2000. I remember she had a seizure. 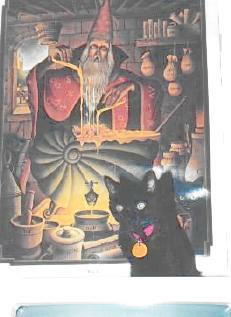 Then we adopted a black cat from Toronto Cat Rescue called Kokomo way back on October 11, 1995. 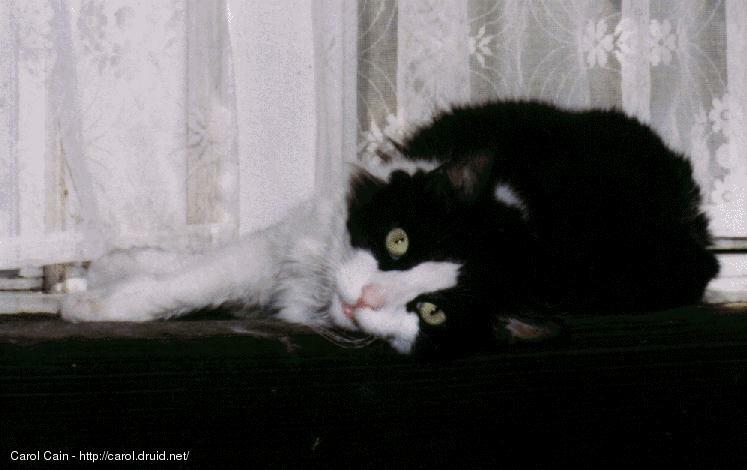 We lost him on February 8, 1999 to FIP. 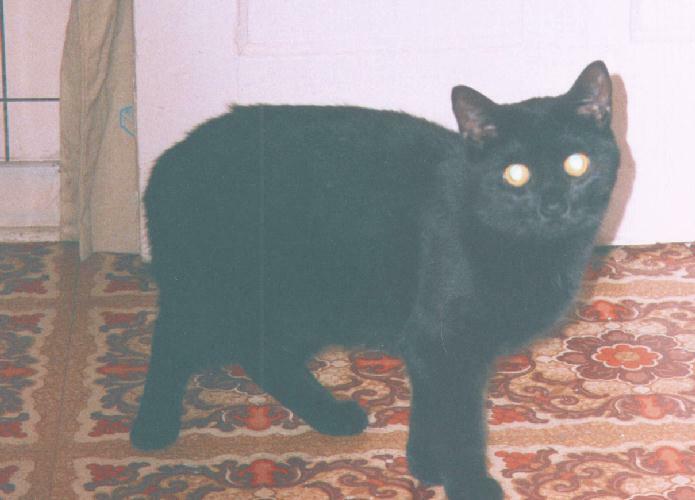 We then took in a cat named Tommy on April 27, 2001. The girl who gave him to us knew we had sick cats in our house that's why we got him. Tommy came in with FIV. Then on August 8, 2001 we found out he was also diabetic. I was shown how to give him insulin twice a day along with a special diet from our veterinarian. I find it easier to give insulin to a cat on a counter changing the location of the injection each time. Since insulin must be kept in the refrigerator, it may shock the cat when injected cold. To prevent this you should roll the needle between your hands to bring the insulin to room temperature. Do not shake the insulin bottle because you could create air bubbles. Gently turn the bottle in an up and down motion and count to twenty. If you have shaky hands your best bet is to hold the syringe at the bottom. I used U-40 needles. I only used each insulin needle for two shots otherwise the needles get too dull and hurt the cat. I have heard some people say that a needle should never be used more than once while others claim that three times is OK. As with any advice or suggestions here you should consult with your veterinarian. If your cat goes into insulin shock grab corn syrup and put it on their gums and get them to your veterinarian quickly. I brought Tommy to the veterinarian every so often to get a glucose reading and to take blood. To dispose of the syringes I used to take them back to my veterinarian and they would take care of them for me. Now I take in only sick cats as long as they have FIP or FIV.